Monday, January 9, 2017: Up at the normal retiree time and prepared the camper for the day’s travels. After dumping tanks, Kit and I were on the road at 1000 hours under cloudy skies with a warm and gentle breeze from the south. 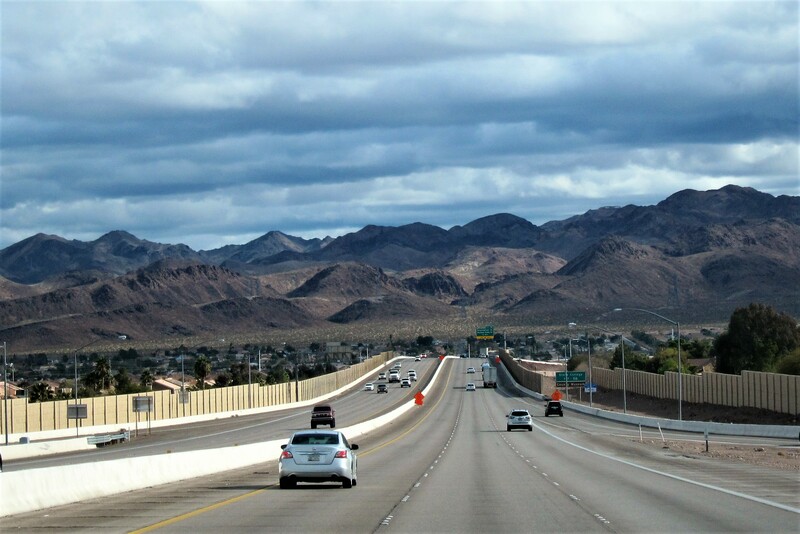 As we left the outskirts of Las Vegas on Interstate 95, the foothills of the McCullough Mountain range came into view. 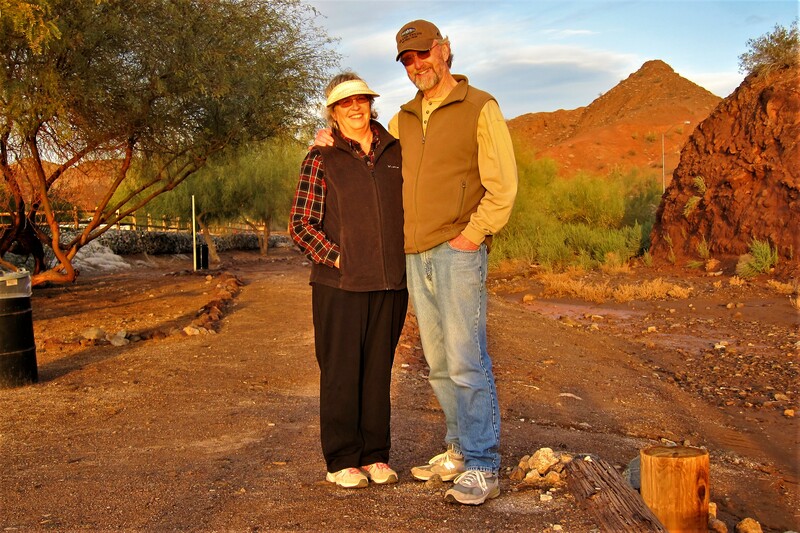 Kit and I were content and felt all was good with our little corner of the world…we thoroughly enjoyed our stay in the area spending time with Suzie, Kevin, Jack and Tucker. 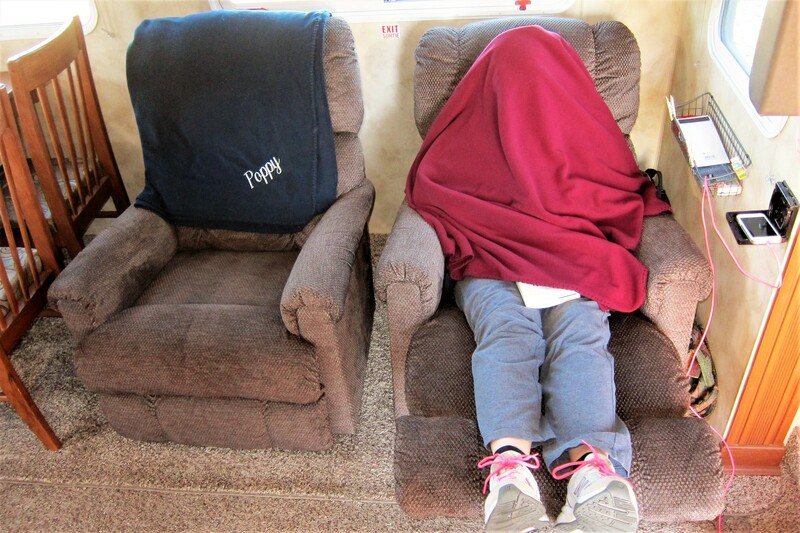 We obviously would prefer that all our offspring were living within an hour of our home in Maine, but being able to visit our expat west coast family as often as we do is a nice feature of the RV lifestyle. Thanks folks for making Christmas 2016 an enjoyable experience! Kit and I decided this morning over coffee to head back into Arizona instead of toward the left coast. 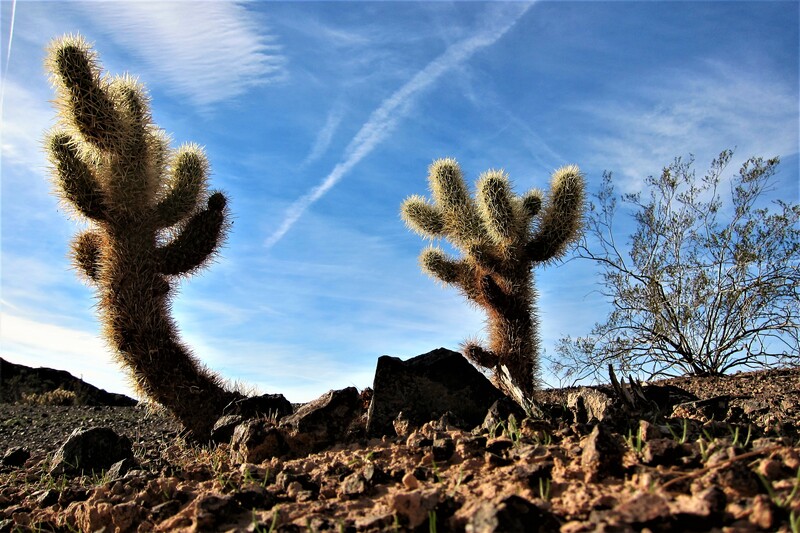 We have family in Tucson, and enjoy spending time with them and enjoying the area while camped in Dewey and Bea’s secluded and nicely landscaped dooryard. There are basically two routes out of Las Vegas heading south. 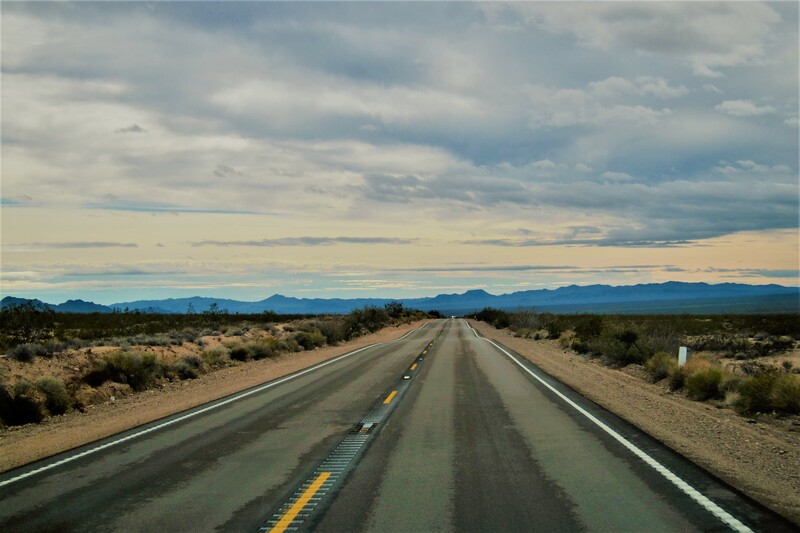 Last month we came north to the city via Highway US-93, so today we decided to take Highway US-95 South which roughly parallels the Colorado River on the California side. As the breeze from the south picked up intensity, we had to deal with a 20 MPH headwind which drastically dropped our MPG into the single digits! 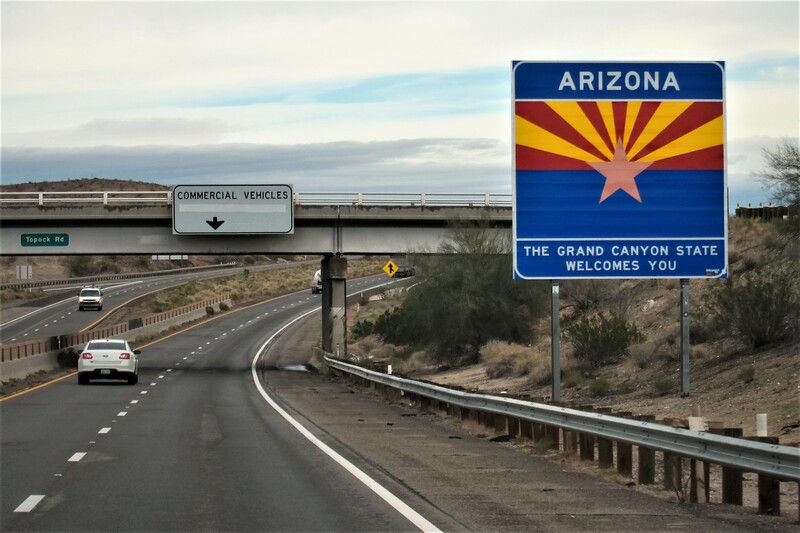 Upon reaching Interstate 40, I pointed the rig east and at around 1345 crossed into Arizona, and once again, entered the Mountain Time Zone, losing an hour of the day in the process. Kit and I don’t agree on everything, either at home or on the road, but we do compromise on most decisions…or frequently will let the other decide on something of importance to them. One item that we seem to always agree on is our preference for the more scenic and rural parts of America…although Kit does favor towns, where I favor less populated destinations. 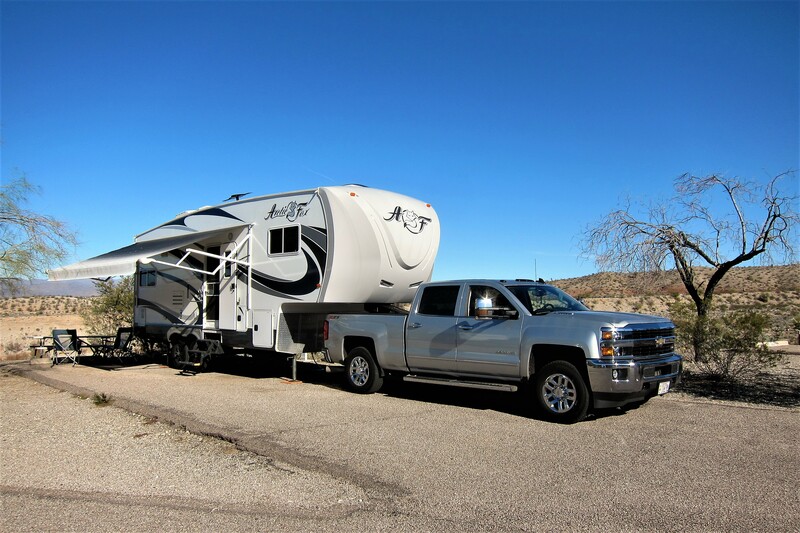 We both like camping in National Parks, or State Parks, even town owned municipal campgrounds far better than the mega RV resorts prevalent in and around major cities. 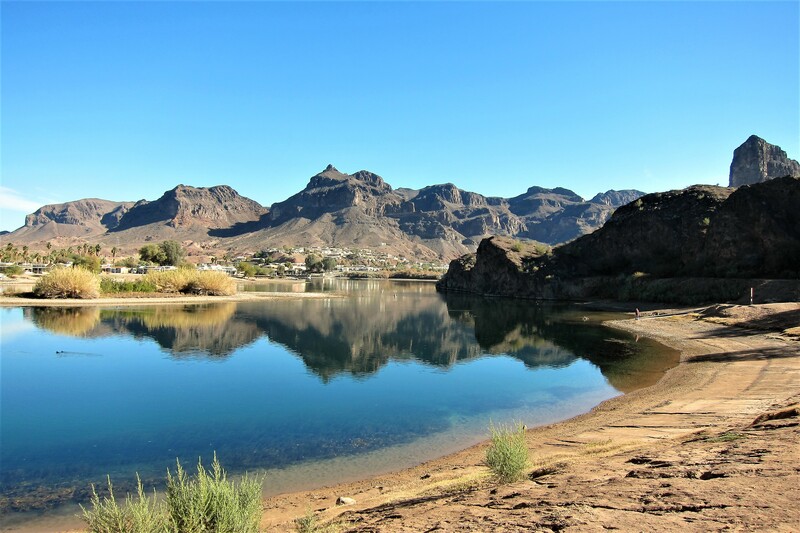 We find that Texas and the Arizona State Park system features the nicest campgrounds in the most scenic locations on the western side of the US. 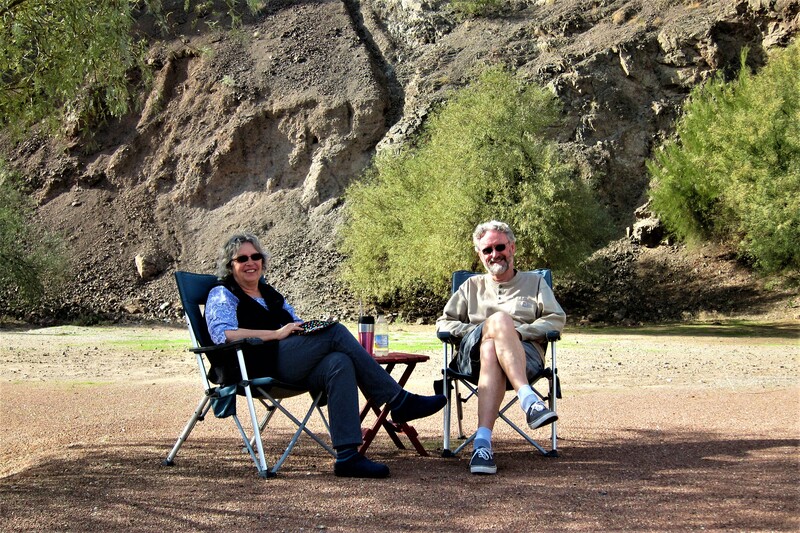 Kit and I have camped in many Arizona State Parks over the past eight years and are on a mission to eventually sample all of them. 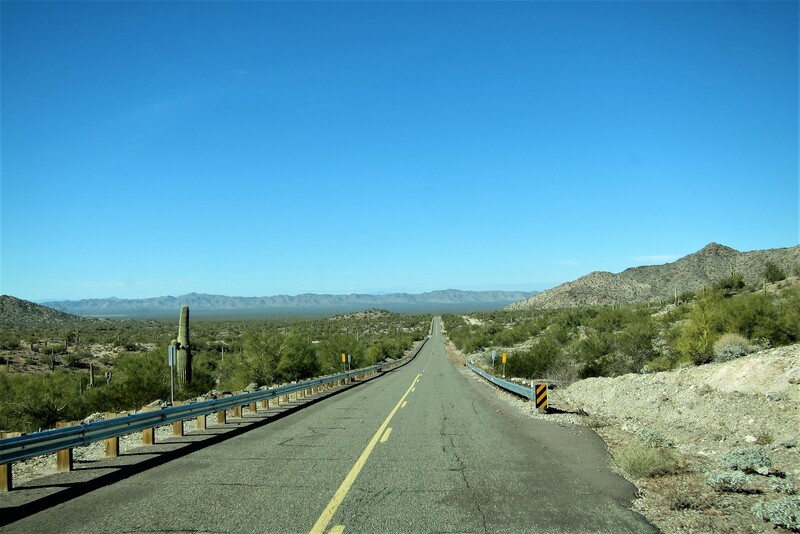 So, as we head south towards Tucson, we are taking the opportunity to visit four Arizona State Parks in four days! 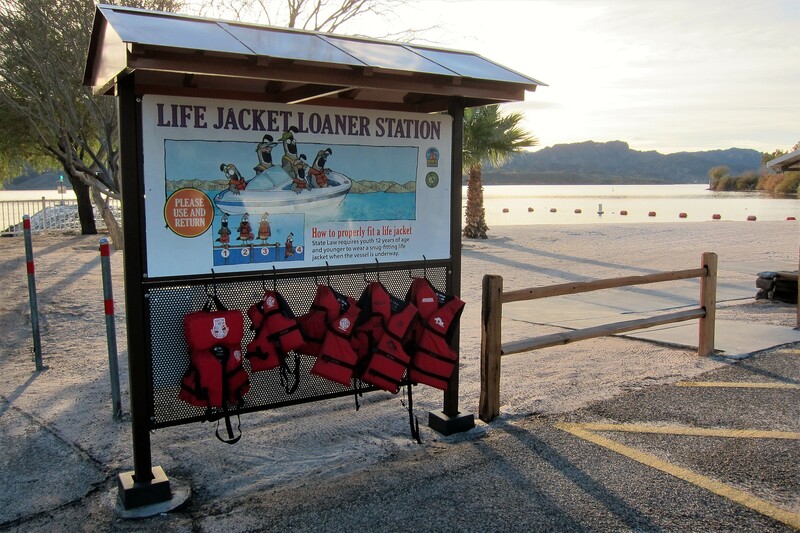 The first stop was Lake Havasu State Park. Pulling up to the ranger station we spotted a sign that read “Campground Full” …drat, our lack of advanced planning thwarted us again! 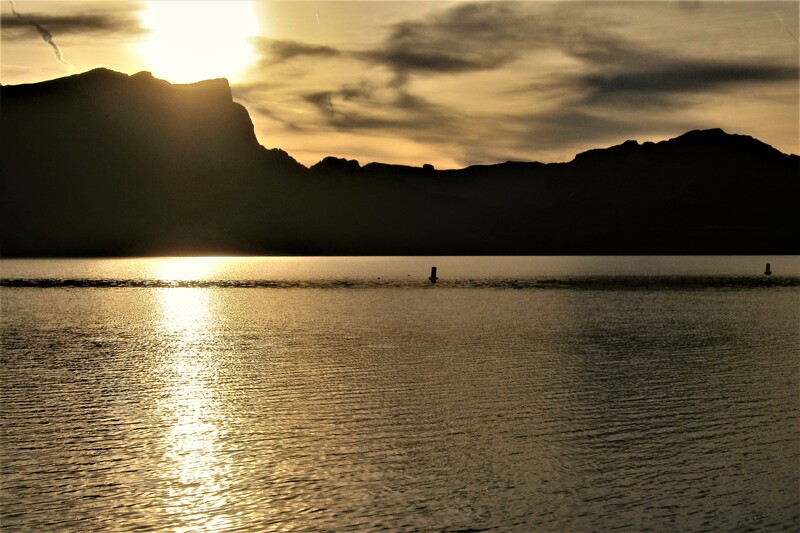 In talking to the rangers, we discovered that the Havasu Balloon Festival was on tap for later in the week and participants had reserved campsites a full year earlier. They were gracious to offer us a spot in their parking lot, which we politely declined. 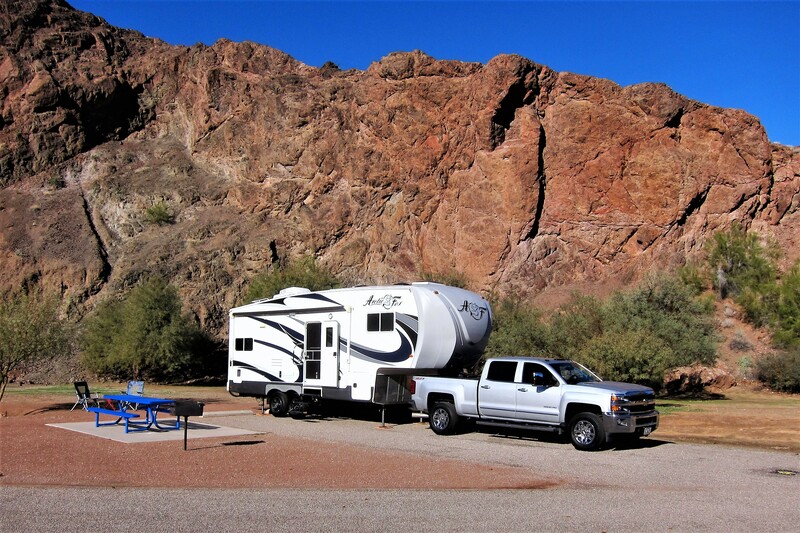 Being a Monday, we were sure to find accommodations at our next destination, Cattail Cove State Park. 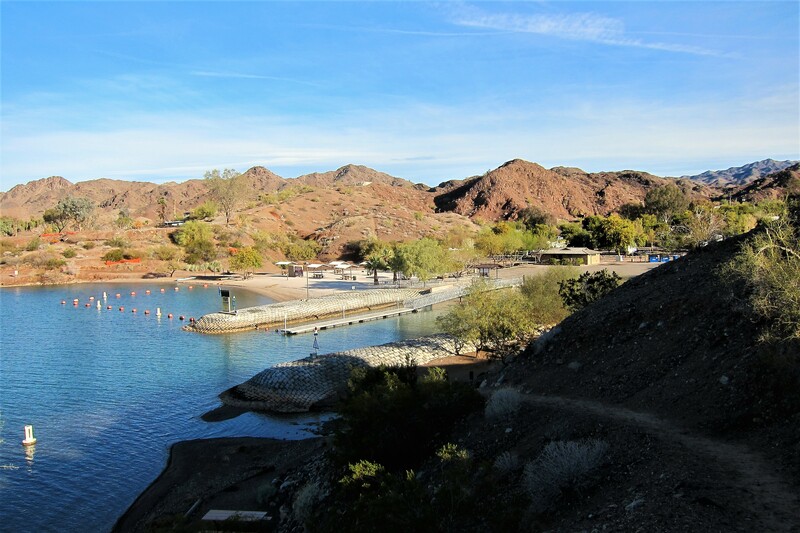 This campground is a hidden jewel situated at the more isolated southern end of Lake Havasu, and there were indeed campsites available! 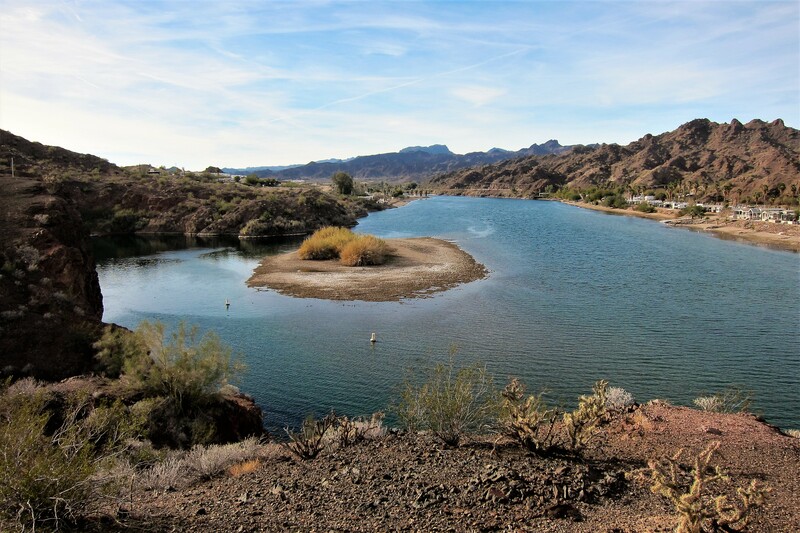 A beautifully maintained and landscaped campground that features a nice white sand beach leading to the crystal-clear waters of the Colorado River…the water source that created Lake Havasu. 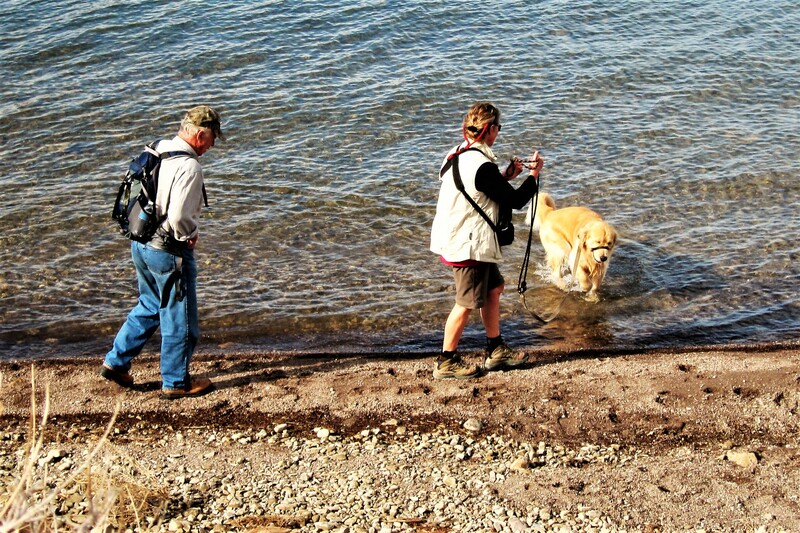 In addition to the beach for humans, Cattail Cove also offers a dog only beach! Where Fido can splash about in canine joy while its owner must stay ashore and just watch. 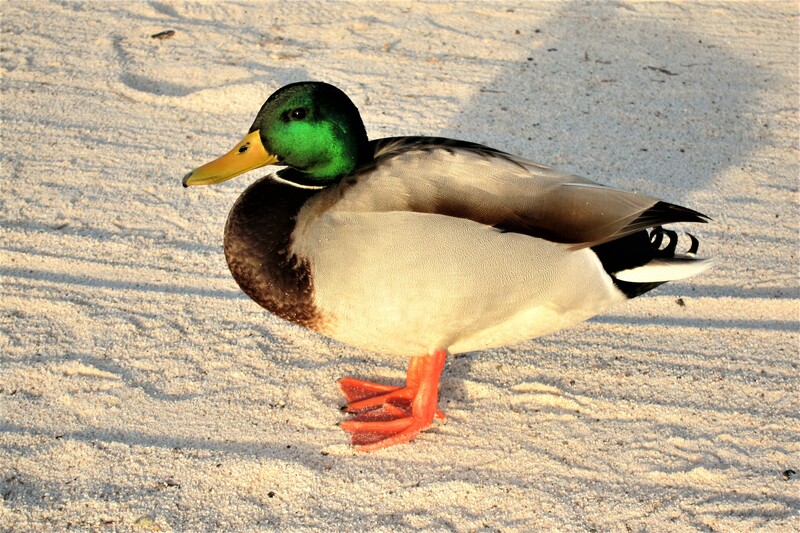 And taking the pet friendly concept even further, the campground has a Duck Beach. 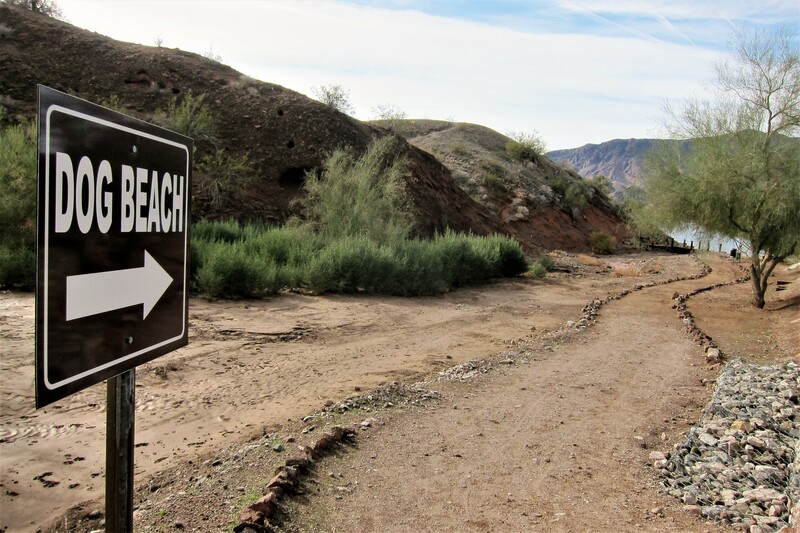 Named for the access gate that is only four feet high, the beach provides a fine place to exercise your “Comfort Duck” that accompanied you while flying commercial air into Arizona a few days prior. 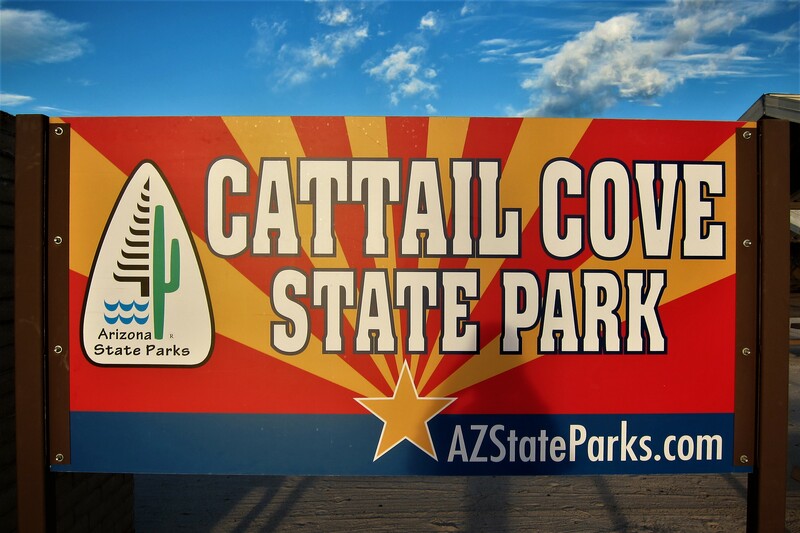 Cattail Cove is an absolutely perfect canoeing and kayaking destination, the park service has even thoughtfully provided loaner paddling vests! 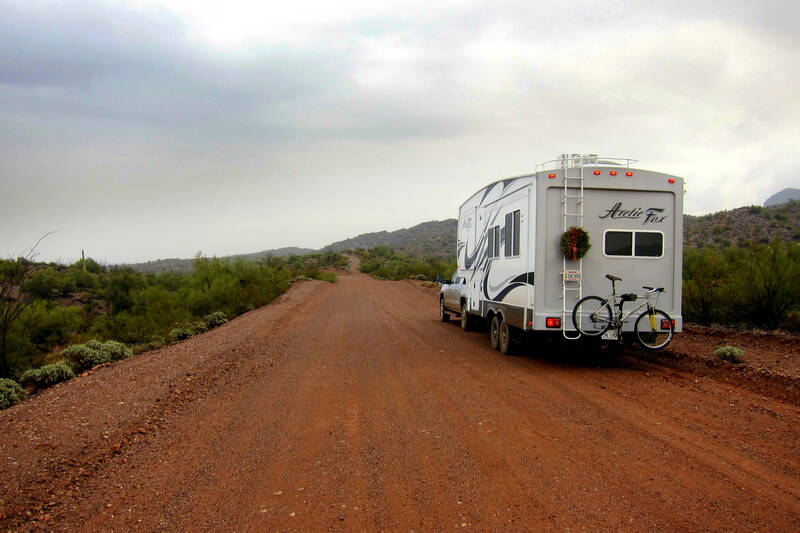 I can see this park ratcheting up to one of our top five favorite state parks in the nation! So, what makes this spot so attractive to paddlers? Well, for one thing there are numerous small inlets and coves peppering the shoreline that invite folks to glide in for exploration. 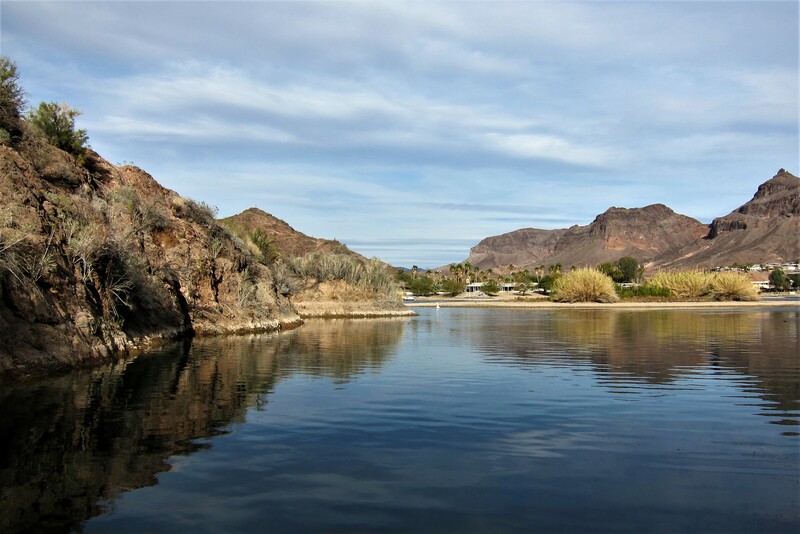 A few of these feature boat-in-only campsites! Secluded and well equipped, with a sheltered picnic table, fire ring, trash receptacles, and an enclosed privy! Our state of Maine has a number of river and lake campsites similar to this, but not as luxurious! …Kit and I enjoyed the suns warmth on this rapidly cooling early evening. Tomorrow we visit another state park, but for now…Goodnight! 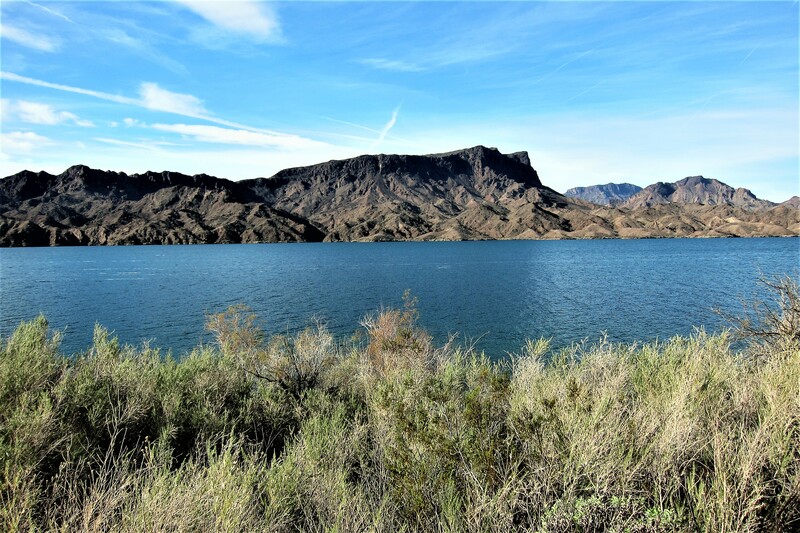 Monday, January 9, 2017-Woke at Cattail Cove State Park to partly cloudy skies and temperatures in the mid 50’s. Since checkout time was twelve noon, and since our next state park destination was only an hour away, I decided to take a short hike on one of the maintained trails while Kit enjoyed some quiet (Non-Bill) time. 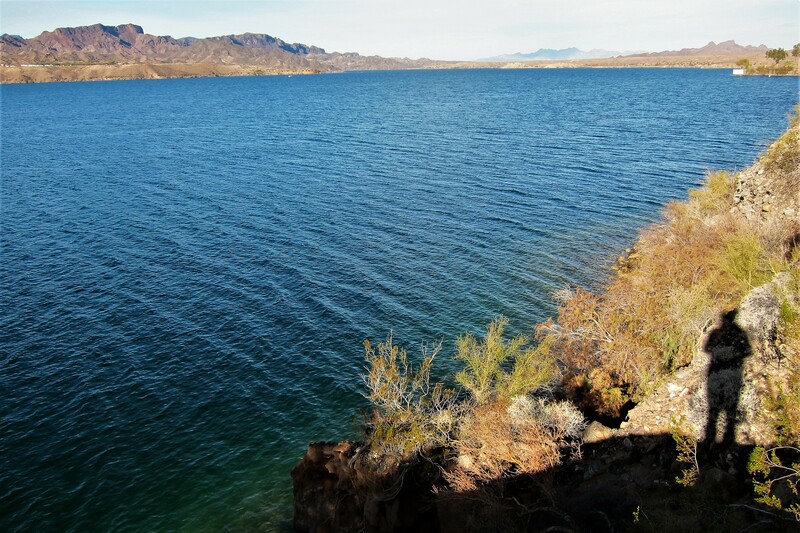 The trail I chose this morning features a four-mile roundtrip ramble that parallels the shoreline of Lake Havasu. The high bluffs rising off the lakefront affords one an incredible view of the water and surrounding countryside. In the photo above, you may notice the image of a first nations resident that inhabited this land long before we palefaces came along. He must have taken a liking to me, as whenever I looked back, he was following along close behind! 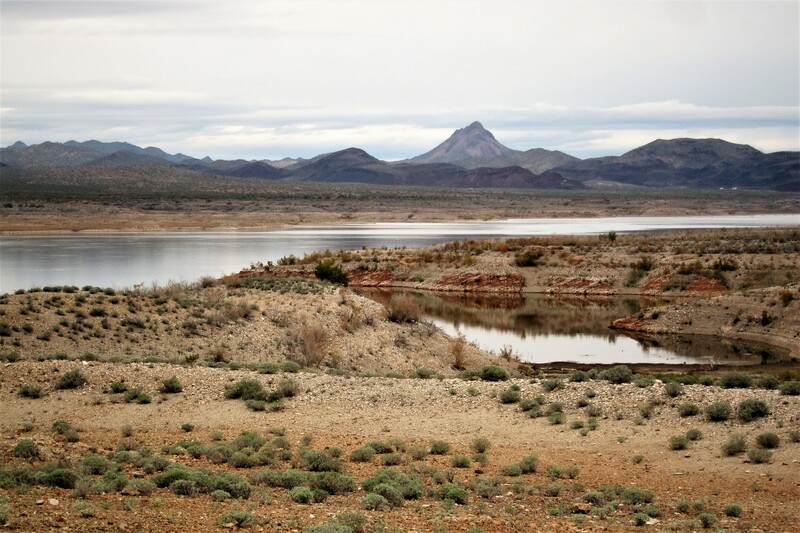 At the trail’s terminus, there lies a large plateau that juts out into the lake. Spent a while walking about and spied this interesting piece of stone art tucked away in an isolated corner. 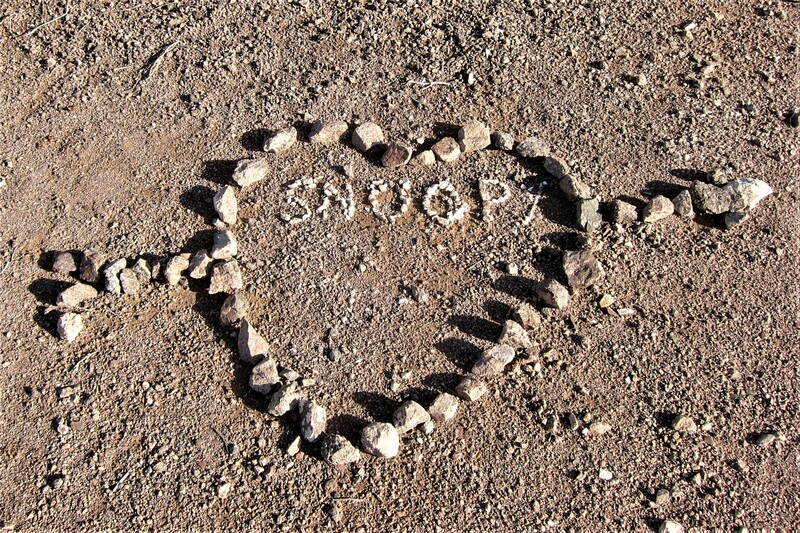 I think it might be a memorial to someone’s departed pet, likely a faithful and devoted hiking partner. Looks as if the creator left room for another name…maybe his own? 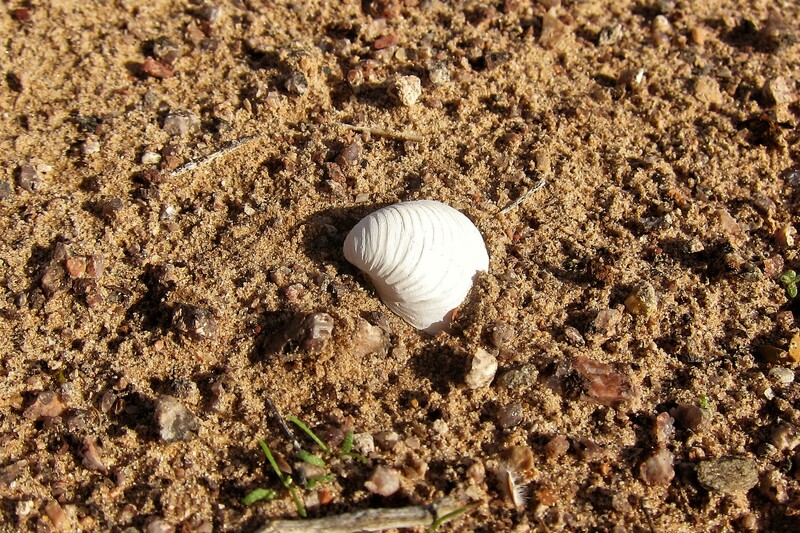 I also notice a several seashells…an odd sight since the sea is 300 miles to the west. 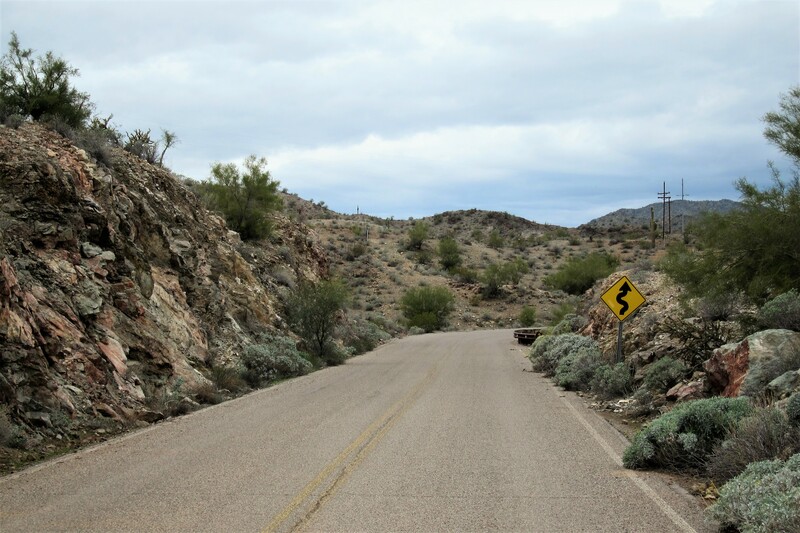 Then I recalled that this whole area was ocean back some four million years ago, and there are many areas where shells and fossilized remains of ocean animals are scattered about the desert southwest. I thoroughly enjoyed the early morning hike, and the peacefulness of being miles from civilization. 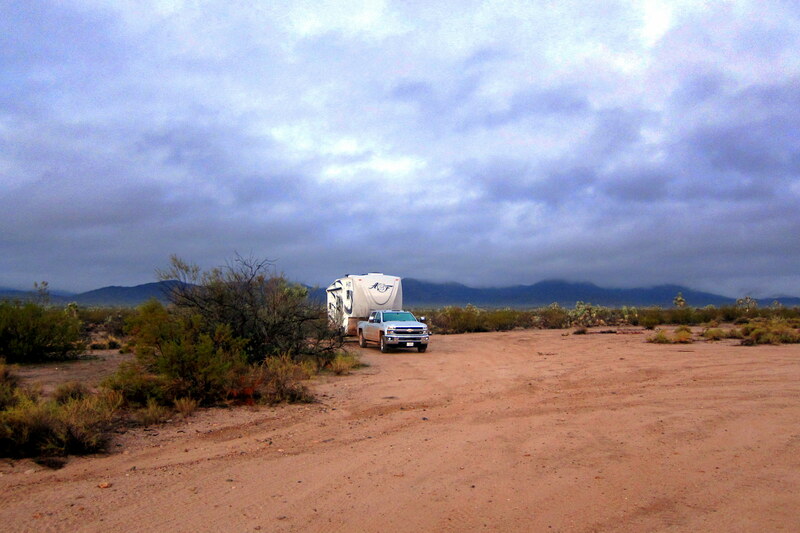 However, since the morning was wearing on, I made a hasty retreat from my lakeside mesa and returned to the campground. Kit and I got underway at 1145, as a motorhome was idling a short distance away waiting for our spot. 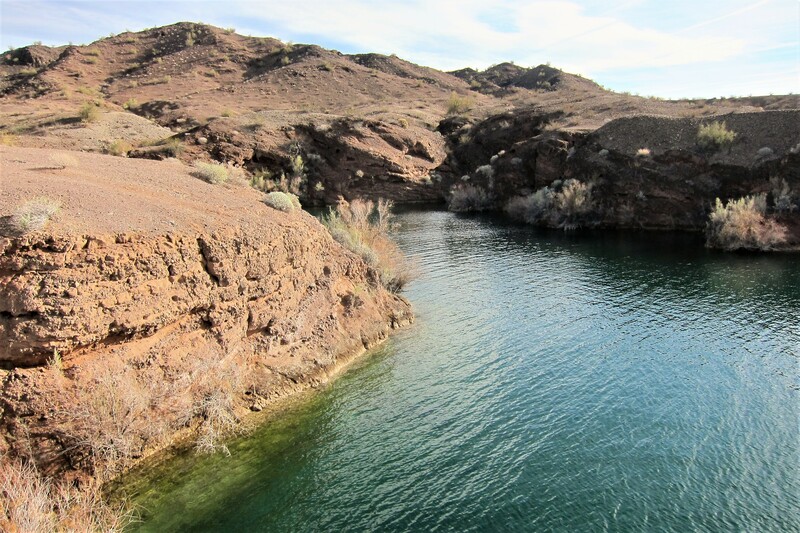 Cattail Cove State Park is a place we agree belongs on our return-to list…however, next time I will be packing a kayak! 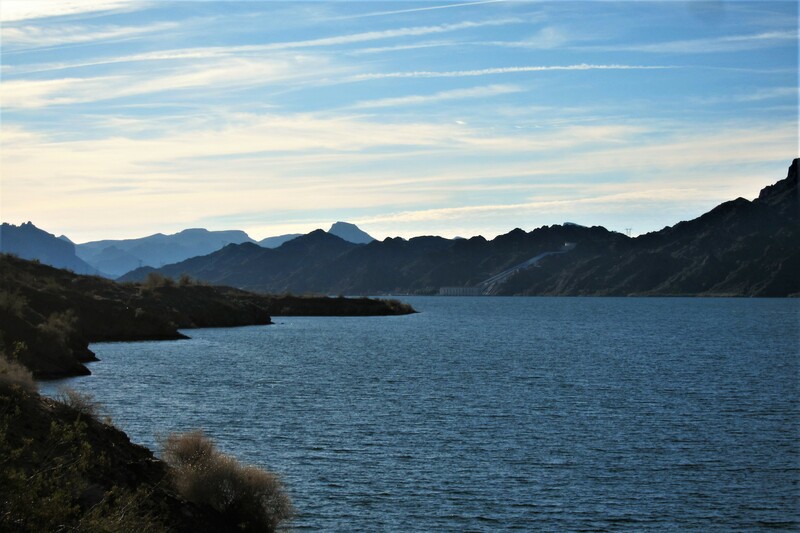 A short 13 miles down Arizona Highway 95 finds Parker Dam, which lies 155 miles downriver of its more famous cousin, Hoover Dam. 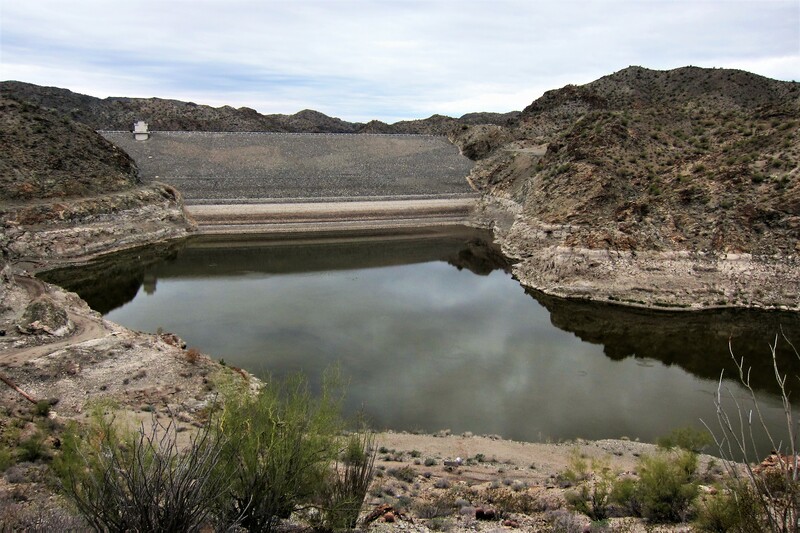 At 320 feet, Parker is noted as the world’s deepest dam as it impounds the Colorado River to create Lake Havasu. 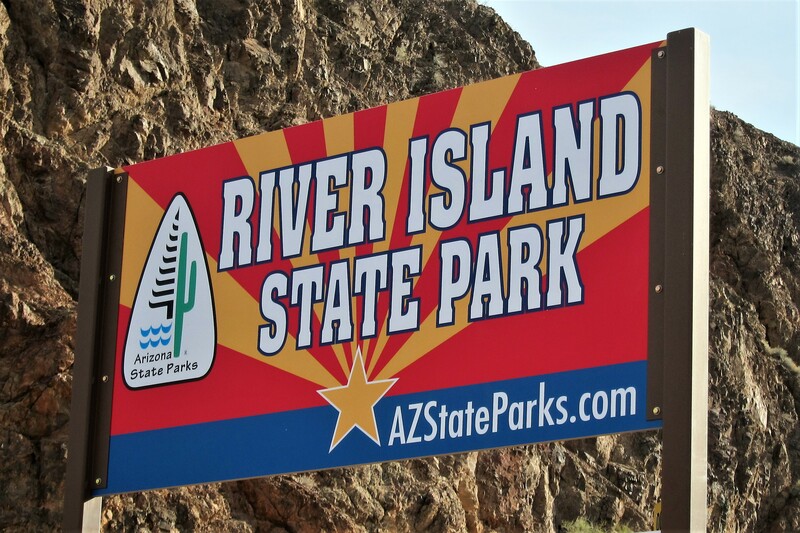 A few short miles downriver from the dam lies our next destination…River Island State Park. Where we scored a nice isolated campsite hard up against a tall sandstone and rock cliff. 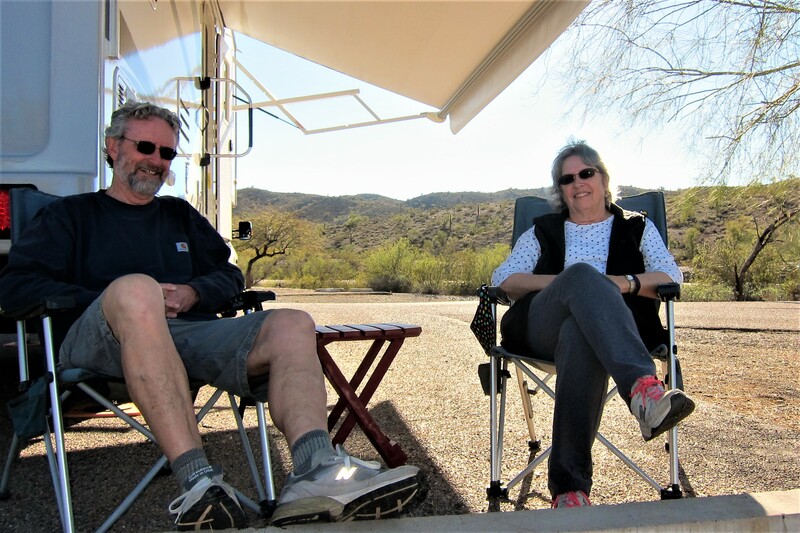 The weather has warmed considerably…with temperatures in the low 70’s it was time for me to don shorts once again after which Kit and I sat in the shade of a nice Palo Verde tree and chatted over some cool drinks. 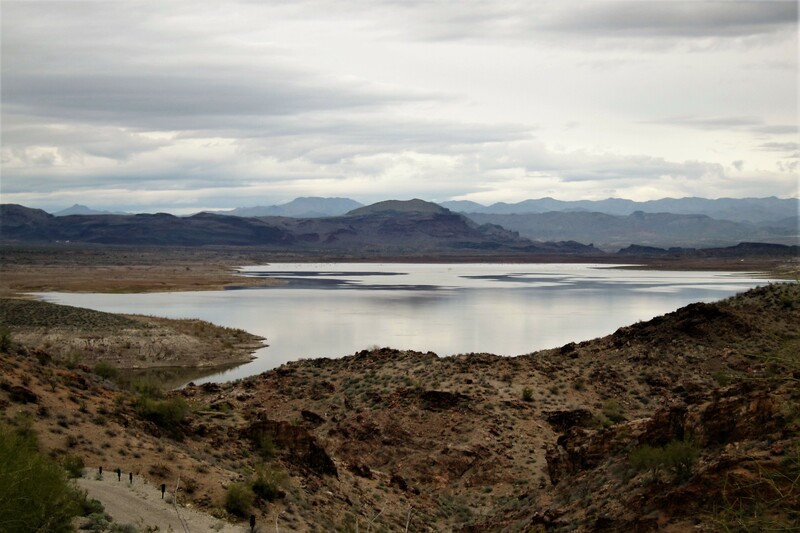 River Island State Park is below Parker Dam and therefore officially on the Colorado River. The cove that the state park sits on features a nice beach. Which is suitable for fishing, swimming, or launching a kayak to paddle the river. 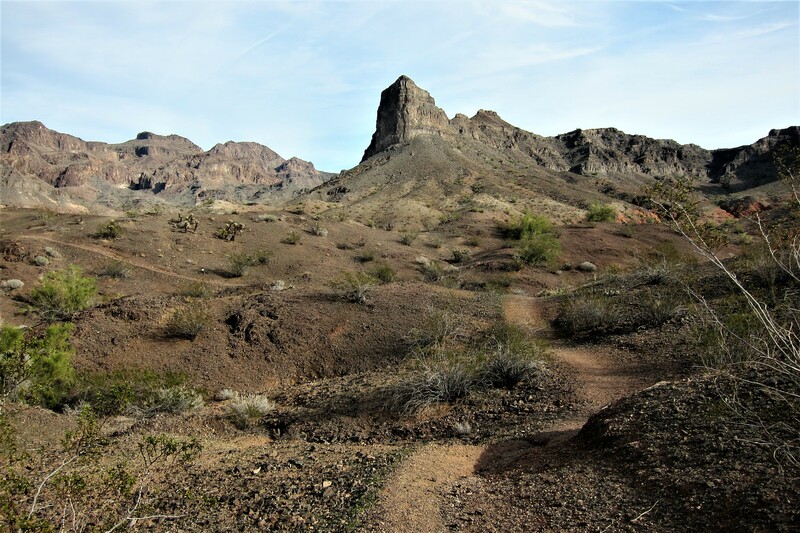 There are a few hiking trails that lead from the campground. And the trail I selected deposits you on a high outcropping where a bird’s eye view of the state park, and the island that gives it its name, can be viewed. 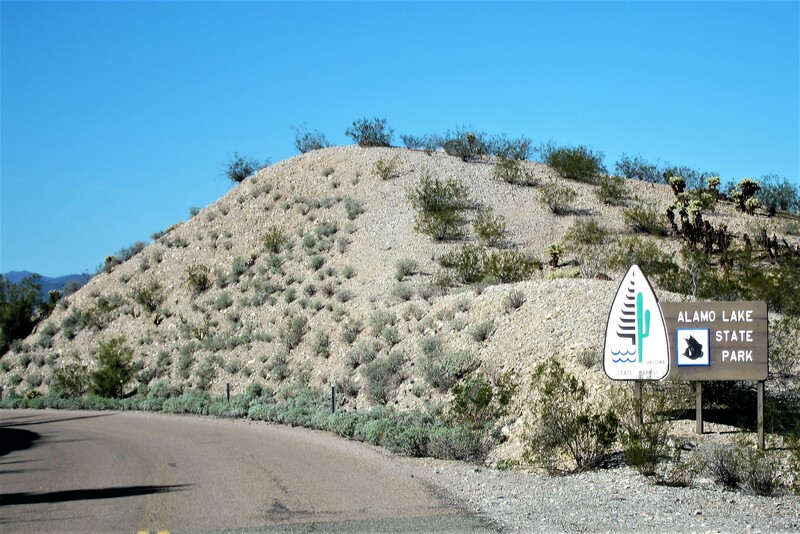 Even though it is easy to forget you are in the desert due to the abundance of water from the Colorado that keeps riverside vegetation green, a short distance away from this riparian zone the desert and its plant life retakes the terrain. Back in camp, Kit and I enjoyed a nice dinner, a few cocktails, some catching up on personal and world events via the internet, and then turned in early. 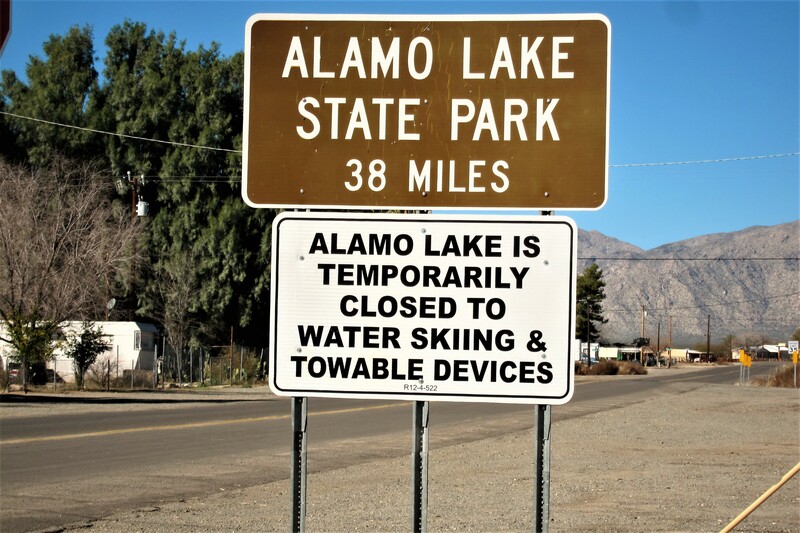 Wednesday, January 11, 2017: Today is a day that I’ve looked forward to for a year now…come heck or high water, we are gonna locate, and camp at, Alamo Lake State Park!!! If you’ve been following our annual misadventures, then you may remember last years “lost in the desert” episode where I made an ill-advised decision to take a short cut to Alamo Lake on a long lonely dirt road. After an eight hour “adventure” we were within sight of the lake but a large wash (dry river bed) loomed between us and our destination. Then it started to rain! Discretion being the better part of stupidity, I decided to fall back to the north and seek safe haven before the roads became unpassable. The next morning, with the sun shining, we woke and continued our retreat to the north, and after 24 hours, finally arrived back at our point of departure. All’s well that ends well. 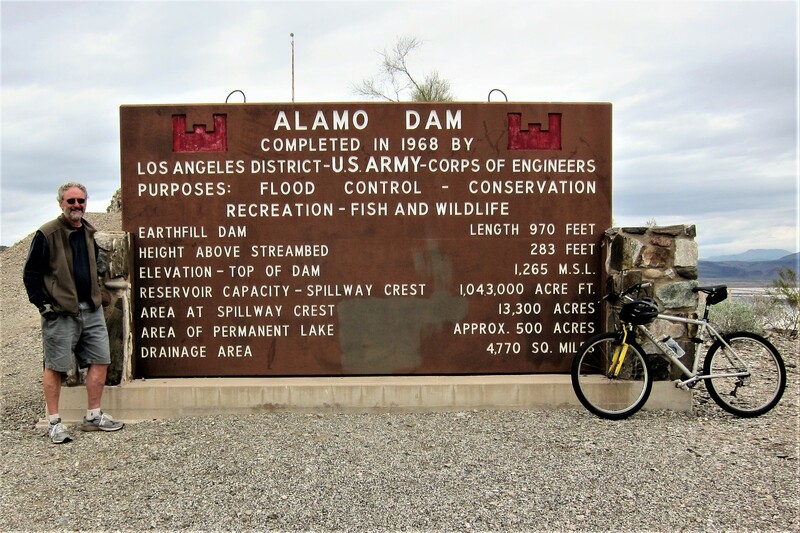 However, there remained a lasting desire to conquer the trail to Alamo Lake…by way of the more conventional, and longer, but safer, route! 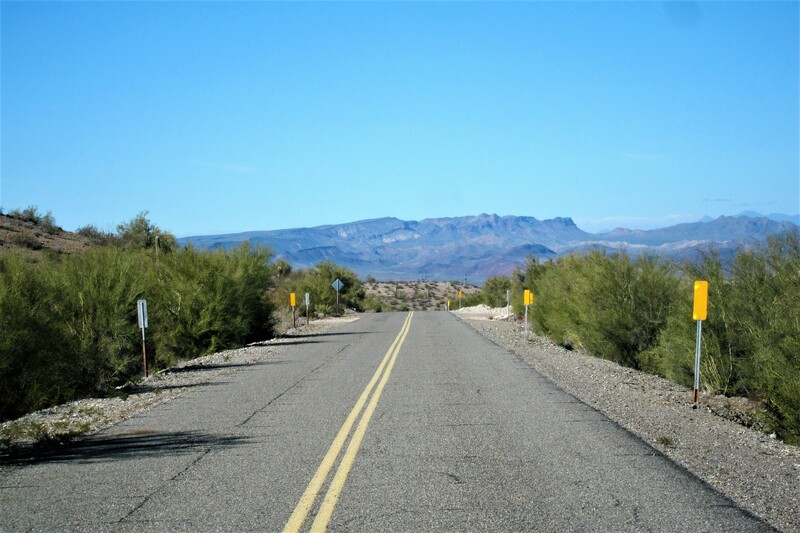 In the town of Wenden, Arizona we pulled off highway US-60 and headed north on the paved Alamo Lake Access Road. 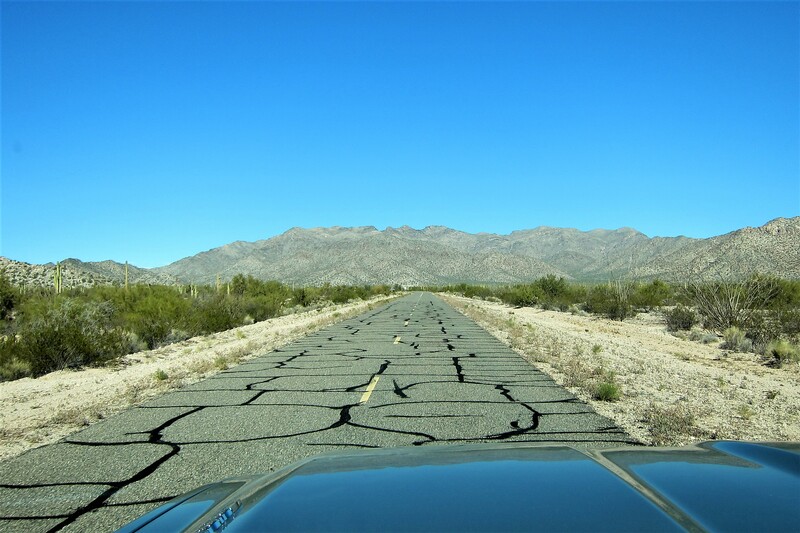 Yep, 38 miles of narrow two lane desert driving…this place is isolated! Well, except for a farming operation we came across within the first mile. 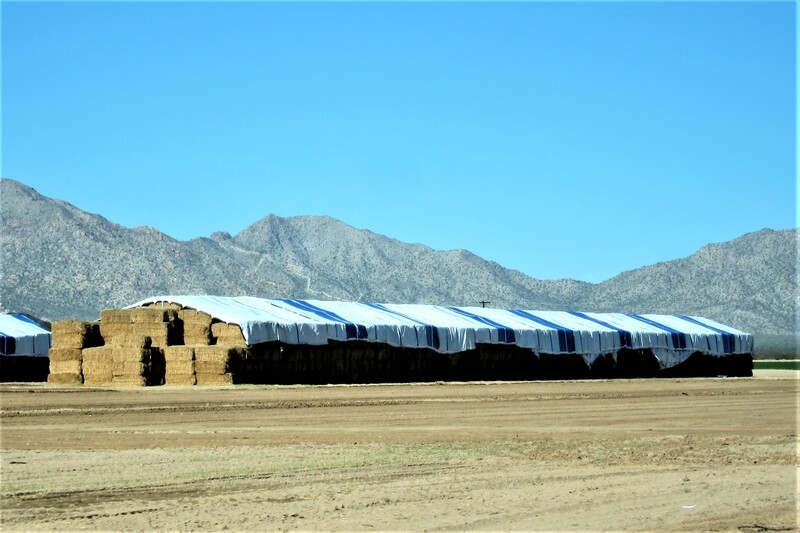 That hay-bale structure looked to me like one of the three little pigs went condo! About half way to the state park, the road pretty much stayed the same. 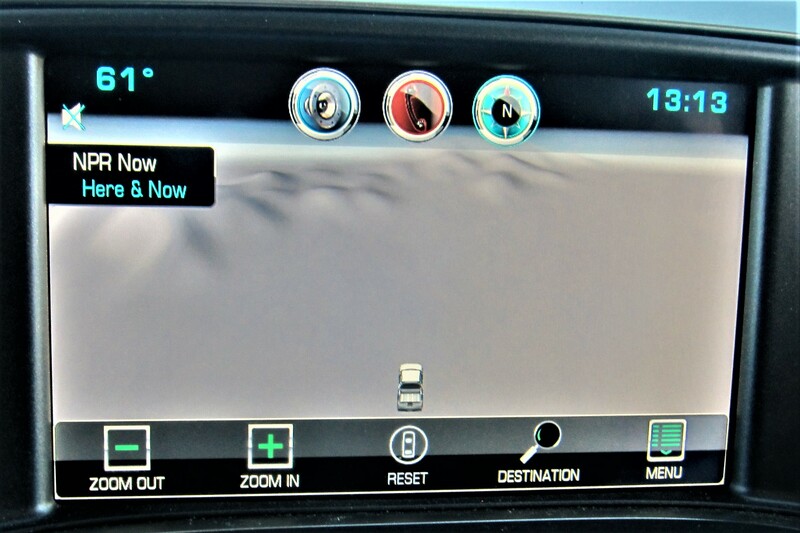 Except for on the GPS screen where the terrain look similar, but the road had disappeared…yikes, not again! But the paved road continued along, and the windscreen view was pretty much unchanged from an hour earlier. Eventually, the sign I had been thinking about for a year finally came into view! Dropping down into a valley, we observed the only water in this parched land for miles around with a campground ringing the mesa above it. Checking in we scored a nice campsite on the rim of the mesa overlooking the lake. Then spent the remainder of the afternoon relaxing and congratulating each other on our success of finally reaching Alamo Lake! Since it took us a year to finally get here, and since it’s a 76-mile round trip from civilization, we decided to spend two nights…one for the missed opportunity of last year and the second for our success this year. Spent the remainder of the day getting acquainted with the area and relaxing in the warm afternoon sun. Then, following a nice meal and a nightcap it was soon time for bed…goodnight from the middle of nowhere! 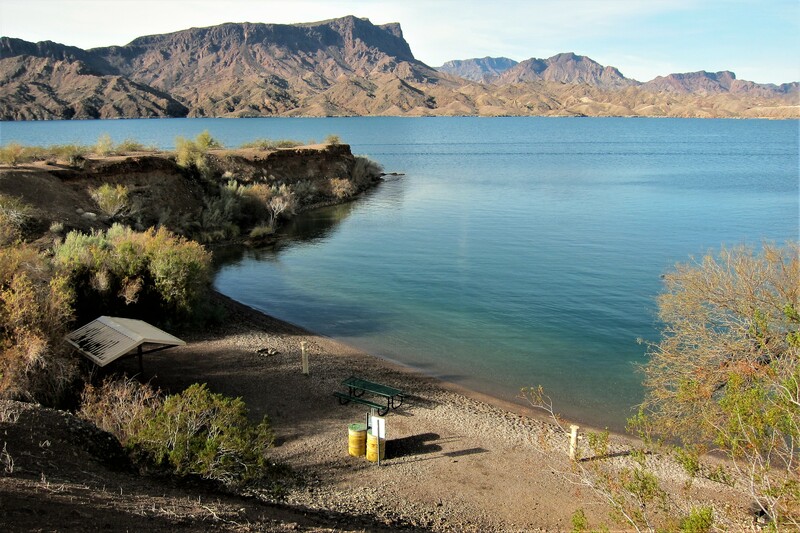 Thursday, January 12, 2017-Alamo Lake State Park, Arizona: Spent the night being serenaded by coyotes and wild burros, with the occasional wild animal sound that couldn’t be identified but sounded as if from the cat family! 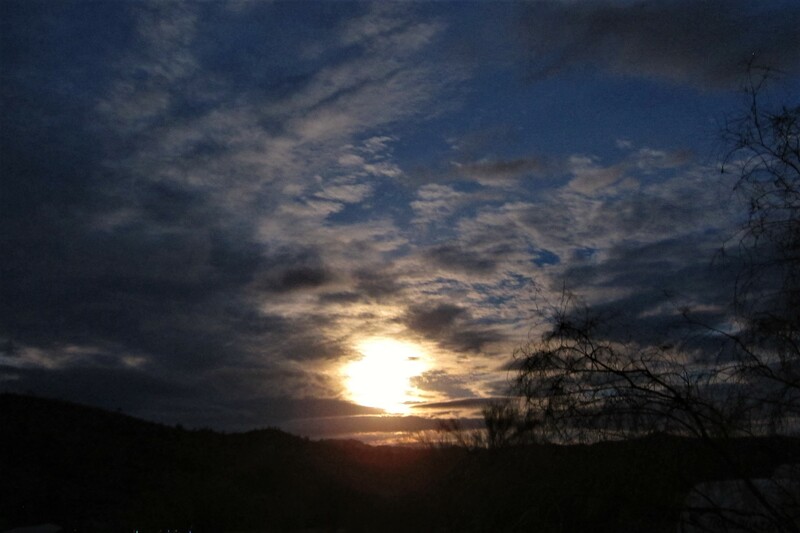 Then, come daybreak, Kit and I observed a unique astrological vision…a setting full moon to the west. And a simultaneous rising sun to the east. It’s going to be a great day! 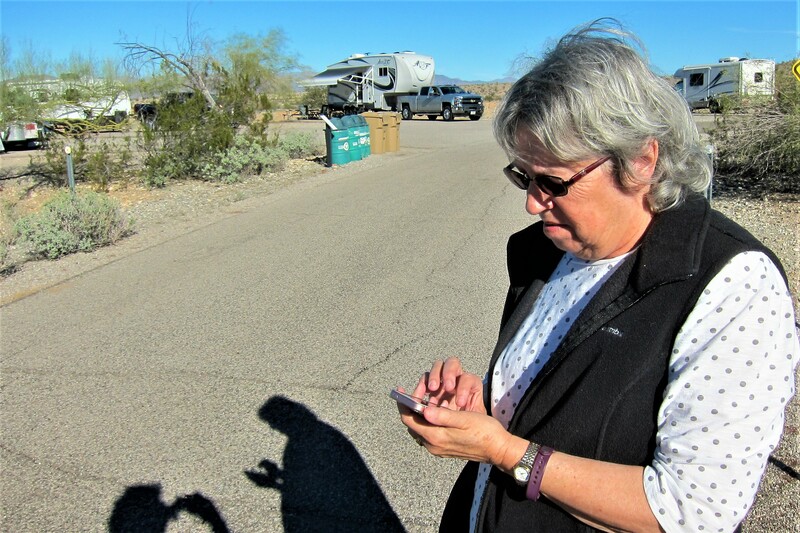 Well, I think so anyway…Kit is a bit perplexed that there is no cell phone service or Wi-Fi to be had. She spent a bit of time walking about to all corners of this land with her phone held high looking for the elusive signal! Being unsuccessful, Kit decided to retreat to the camper, build her a personal blanket fort, and pout. I decided Kit needed some alone time, so because It’s been a while since I’ve had the time or the weather to ride my bike, and today I have both, I un-racked the machine, lubricated everything that moves, topped off the tires, and took off on a cycling adventure. The first stop was Bill Williams Overlook. I should pause here to mention that a destination called an “overlook” is likely reached by traveling uphill…and this place was no exception. In addition to a nice view of the impounded reservoir. Only spent a few minutes at the top as it was cool with a breeze from the north, and some threatening clouds off to the West. Physics tells us that what goes up, must come down, so I pointed the bike downhill and released the brakes. Yep the yellow caution sign with the squiggly arrow denoted a twisting road…all the way to the bottom! Fortunately, there wasn’t any traffic on this park road as I needed to utilize both lanes to negotiate some of the tight turns! Yea, I could have squeezed the brakes to scrub off some speed, but gall-darn it, I earned this thrilling “E Ticket” ride! 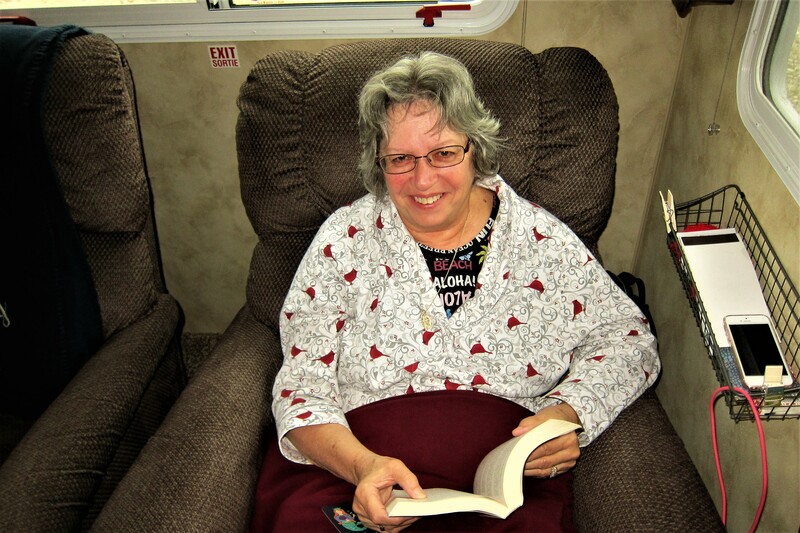 Back at the camper a few hours later, I found Kit in a much better mood reading her latest novel…A Prayer for Owen Meany. She did seem perplexed however when she tried to swipe the written parchment to navigate to the next page. After lunch, I went out on the bike once again…boy, I’m going to pay for all this activity by tomorrow! Meandering through the foothills that surround the state park I came across this little fellow. 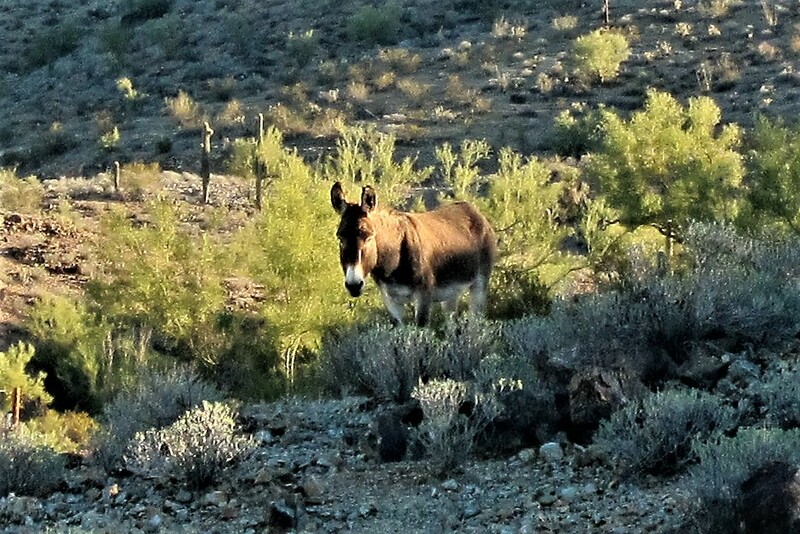 That is one of the resident Wild Burros that prospectors brought to the region during the mining boom of the 1860’s. Native of North Africa, the burros faired quite well in the arid Southwest after being released following the mines being played out. Today, Arizona counts over 5,000 federally protected wild burros. 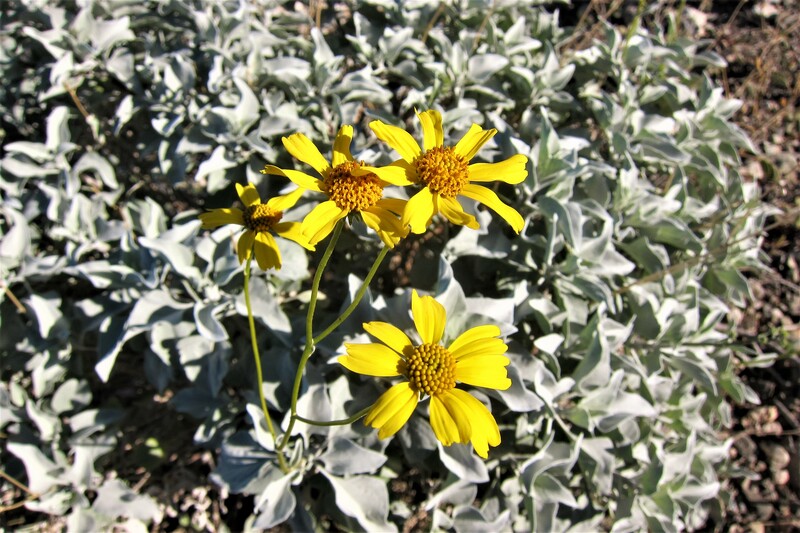 All along the trail were these happy wildflowers that have sprung up once the rains of winter have provided moisture to their roots. Back in camp, Kit and I spent time visiting with our campsite neighbors. 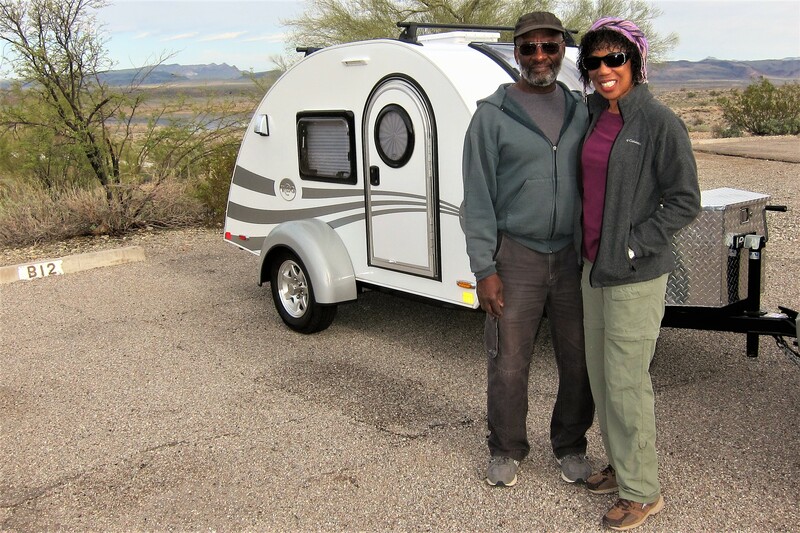 DeGolden and Suzanne are retired elementary schoolteachers and love camping in their efficient right-sized camper. 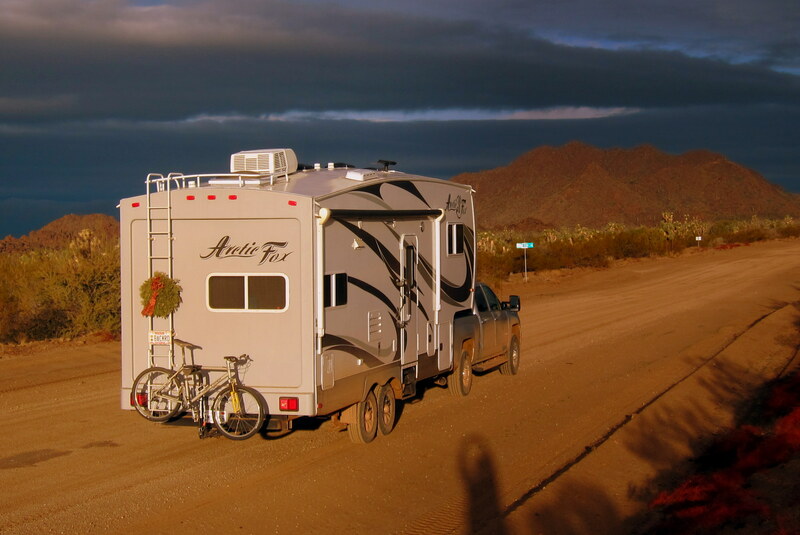 They are in the forefront of an RV revolution to downsize from the 45 foot mega busses…the RV’s once coveted to impress your campground neighbors with just a few short years earlier. We thoroughly enjoyed talking to them and hope they accept our invitation to travel east and visit us in Maine. Tomorrow we head back to the city of Tucson and a long-anticipated visit with family…stay tuned! Glad you are checking out the AZ State parks! And (almost) back in our neighborhood again! We are at Snowbird Mesa….for a few more weeks…then heading home early. Happy traveling….John R. has a new Glider that soars above Snowbird Mesa on good days! Really tardy replying to this but glad we got to see you last week…safe travels home! Thanks, Nancy….yes Arizona is indeed a magical place, and so diverse! What other state borders a foreign country, features terrain from below sea level to alpine peaks reaching 12,600 feet, provides incredible sunsets, has many beautiful state parks, provides some of the best authentic Mexican food in the nation, contains one of the greatest National Parks, and is the annual destination for 300,000 winter weary snowbirds! I so wish Bill and I were following you this jaunt in AZ. Continue the fun adventure. INTERESTING 2 YEAR EXCURSION TO ALAMO LAKE! THIS WAS ONE OF THE FIRST ADVENTURES WHERE YOU DIDN’T ENJOY ANY LOCAL RESTAURANTS! ENJOY YOUR STAY IN ARIZONA AND BE SAFE!! Thanks, we will…hope you guys had a nice dinner with Winston and Nancy! Fun segment as always! Kit, with all the miles you cover, you must not be able to read in a moving car. I’m worse than a two year with regard to automobile travel (put me in an airplane) but reading a book in the car helps me pass the time! Kit helps navigate, and we listen to NPR a lot…other than then we generally trundle along lost in our own thoughts! 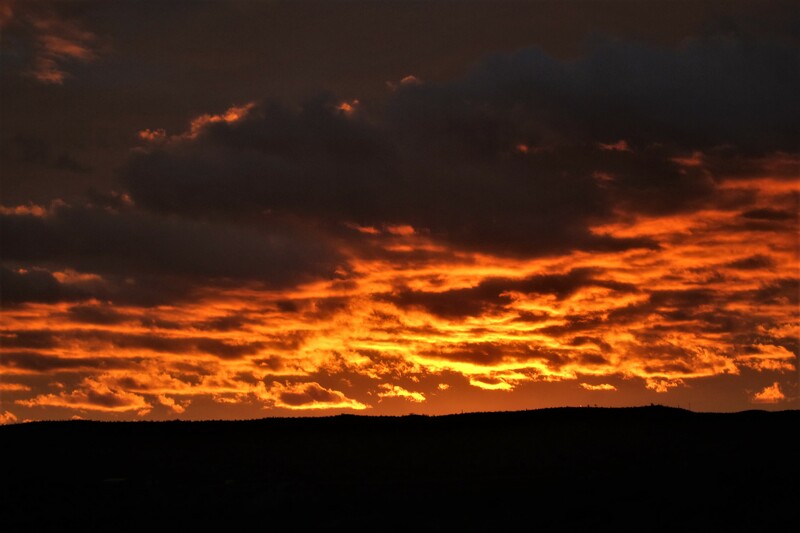 Thank you Judy….bet you enjoyed many a beautiful sunrise and sunset while cruising on your sailboat! Stay well, and hope to see you this summer!! Thanks for sharing your great adventure! Loving it! Hi Jane, thank you for the kind comment! Kit and I are having a blast running away from home and seeing the USA while visiting friends and family…such as you nice folks!